When you need a shipping container in Syracuse, UT, who do you typically call? If your answer isn’t Haulaway Storage Containers, you may be doing it wrong. Not only are we the best storage container company in the Western United States, but we have the friendliest customer service and the highest quality containers. It’s our job to ensure that our customers are satisfied with their experience renting portable storage from Haulaway Storage Containers, so we go above and beyond to guarantee the best service ever. Why wait a week or more just to get a shipping container delivered to your home or business in Syracuse, UT? With us, we offer the fastest delivery times in the business. From the moment you place your order, we send one of our drivers with your custom unit to your home or business. You can expect most orders to arrive within a business day or two. Now that’s service you can rely on! And with so many options to choose from, we know you’ll never choose another company for your storage needs. Our shipping containers make life easier for you. Perhaps you’re ordering for a hospital or school? 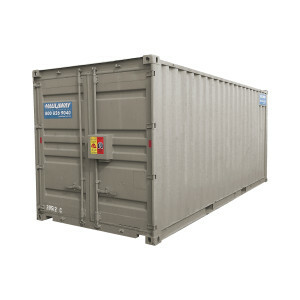 Our 14 gauge steel cargo containers are the perfect option to store valuable records and equipment indefinitely. Sturdy and secure, many of our containers feature our exclusive Rhino Locking System, to ensure maximum safekeeping. Don’t settle for a plain storage container with a simple, easy to break padlock. You deserve the peace of mind that our secure units offer. For more information regarding our units, areas of operation, prices and more, please explore our website or give us a call today!